The inheritance in which the derivation of a class involves more than one form of any inheritance is called hybrid inheritance. Basically C++ hybrid inheritance is combination of two or more types of inheritance. It can also be called multi path inheritance. Following block diagram highlights the concept of hybrid inheritance which involves single and multiple inheritance. Above block diagram shows the hybrid combination of single inheritance and multiple inheritance. Hybrid inheritance is used in a situation where we need to apply more than one inheritance in a program. As in other inheritance, based on the visibility mode used or access specifier used while deriving, the properties of the base class are derived. Access specifier can be private, protected or public. 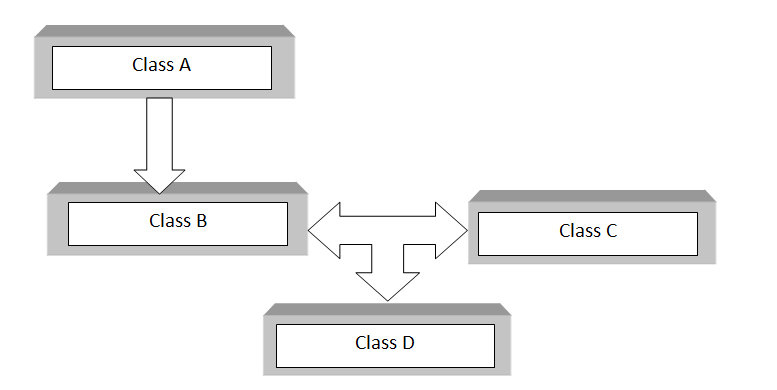 As shown in block diagram class B is derived from class A which is single inheritance and then Class D is inherited from B and class C which is multiple inheritance. So single inheritance and multiple inheritance jointly results in hybrid inheritance. Here is a simple program to illustrate the concept of hybrid inheritance in C++.